If you want to escape the hustle and stress of life and lose yourself in the ultimate northern lake fishing experience then fishing Great Bear Lake should be in your plans! Located within Canada’s remote Northwest Territories this lake is a legendary fishing spot in North America for Lake Trout and of the best in the world. With an area of over 12,000 square miles and peak depth of 1460 feet (31080 sq km/445 m), it is the largest lake completely within Canada’s borders and also the fourth largest lake in North America. This awe-inspiring, pristine lake is a wonder to behold and is really unlike anything else you might encounter. The lake and its tributaries which include Whitefish River and Big Spruce River have largely remained untouched by the Commercial fishing, pollution and other detrimental activities that have adversely affected so many other great bodies of water. In this Canadian Arctic picture of tranquility and natural beauty, you are just as likely to see a Caribou or two or a herd of Musk Ox as you are people. Most of the time you will feel as though you have the lake all to yourself. 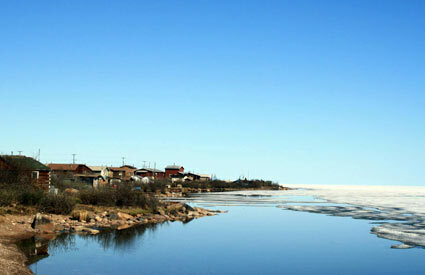 In fact, the only community nearby to this freshwater ocean is the small town of Deline (population of less than 700) on its western shores, a place credited with being the birthplace of modern ice hockey. Most of Deline is made up of descendants of the indigenous Sahtu Denes, many of whom still hunt, fish and trap at least part of the time for their sustenance. From here and along the lake’s shores you’ll find your Great Bear Lake fishing guides, fishing lodges, and all-inclusive fishing packages. Great Bear Lake Fishing is a year-round event with ice-fishing dominating the colder winter months. In fact, the lake is usually covered with ice for 8 or 9 months of the year, often lasting until June. But starting with the “ice-out” or thawing in June and for the next 3 months, fishing on Great Bear Lake becomes truly spectacular, especially for Lake Trout. Big Trout are caught during this short season. During the summer months, the Lake trout are actively feeding following a long winter. Late summer to early fall will find them feeding voraciously in the Lake as they prepare for the fall spawning period and, of course, the long cold winter that lies ahead. This is the time to hook a trophy! The fish here tend to be big – their sheer size and the abundance are amazing. Like in most cold arctic lakes, the regeneration process here is slow and fish like the Lake Trout can live 25 years or more and grow to become quite huge. Great Bear Lake has consistently produced some of the biggest Lake Trout catches in the world throughout the years and continues to do so even today. They can on average range anywhere from 10 – 20 lbs, but catches in the 30 – 40 lbs are very common, especially while trolling the lake. Over the years the lake has owned many IGFA All-Tackle World Records for Lake Trout (72 lbs), Arctic Grayling and Arctic Char. Unofficially, there have been several potential record catches here, highlighted by a 2000 Lake Trout catch of almost 79 lbs! Other prominent Great Bear Lake fish species include Northern Pike and Whitefish. Light spinning and fly rods are the tackle of choice on the lake. A Great Bear Lake fishing guide will be your best source for advice on tackle, technique and any other information you’ll need to land the catch of a lifetime while here.